VRARA Members get 30% discount. Email info@thevrara.com for your discount code. 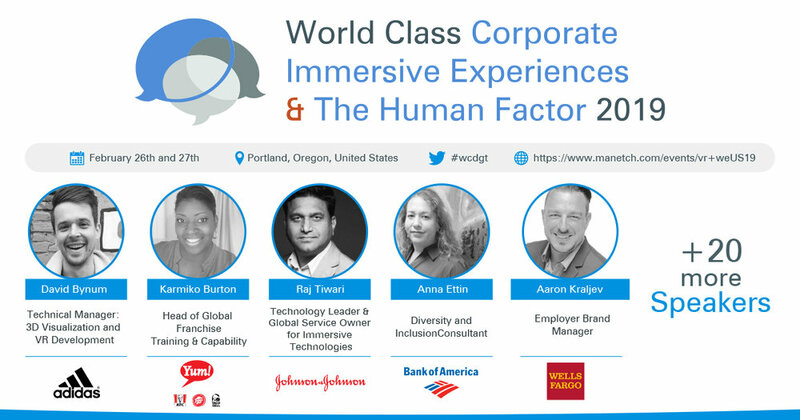 Digital leaders, tech innovators, and industry experts who are leveraging VR/AR in the workplace will collaborate and network at the World Class Corporate Immersive Experiences and The Human Factor on the 26th and 27th of February in Portland, Oregon. Among the 24 speakers are the experts from companies such as Johnson & Johnson, Bank of America, Adidas, VISA, Brown, GreyOrange, TrapDoor, Cigna, NorthState, WellsFargo and many more. They will share insights on how Immersive Technologies up- and reskill their workforce, promote engagement and foster cultural change. Please join the new chapter leadership of the VRARA - Seattle Chapter at CoMotion Labs (4545 Roosevelt Ave, 3rd Floor, Seattle, WA) on August 7th, 2018. From 6:30-8pm for an Innovation Pub: A discussion of the PNW Immersive Landscape and What is Needed to Drive Success. Join the conversation and help inform what the VRARA can do to advance success in immersive technology in Seattle. Contact nirav@thevrara.com for more info.